Believe it or not, Brighton is a city with an ancient past. There have been settlers here for as long as anyone can trace back and it seems that many of the former residents have left their mark. Few people outside of Brighton have even heard of this little hidden gem – The Marlborough Pub & Theatre. It is believed to have dated back to the late 18th century. The narrow little Georgian bar sits below a tiny theatre which can accommodate only a couple of visitors at any particular time. It has been the venue for a number of intimate events which have entertained scores of people over several generations. However, many people who visit leave with memories of a very different kind having experienced paranormal activity in the venue. The Marlborough Pub & Theatre is one of the most haunted places in Brighton and it had a secret past shrouded in darkness! In Victorian times, the landlord was convicted of murdering his wife in the pub when he pushed her down a flight of stairs. However, she didn’t die straight away from her injuries. He had to carry her injured body to the cellar of the pub where he left her writhing in agony for several hours until she passed away. Ever since the murder, there have been strange things happening in the cellar and on the stairs. Disembodied screams are heard and the woman is said to have appeared on stage in the middle of some performances, hovering in mid-air. The building has had six separate exorcisms, but it has not done any good! Even the locals in Brighton may never have heard of Hanningtons, unless they have been around for several years. In its heyday, Hanningtons department store was the crowning jewel of Brighton’s retail industry. However, the building has long since been carved up into a number of smaller stores. However, this can certainly not wipe out the history of the buildings and there is at least one former employee who is not at all pleased with how things have changed at Hanningtons! Maria Gibson was first employed by Hannigtons in 1897 as a shop girl. She remained continuously employed there up until the 1960s during which time she worked her way up to department manager. She was well known for running a very tight ship and she had no time for lateness, poor service or immodest behaviour from her staff! Maria’s spirit is said to haunt the hell of Hanningtons and she is known for demonstrating her displeasure at some of the brands and items for sale in the boutiques that inhabit the building today. Items such as expensive handbags, lingerie and mini-skirts have all been known to go missing only to be found hidden somewhere else in the building. This might have been put down to theft, perhaps by employees had it not been for the fact that the items are just as often thrown in customers faces in disgust – with nobody there to have done so! Today, Brighton is known for being a bright and colourful seaside resort filled with neon lights and thousands of tourists. However, the town has a long and rich history. It can actually be traced all the way back to the very dawn of society as we know it. The first people to settle here would have been Pagan cannibals, followed by the Celts and then the Romans, the Angles and the Saxons. Each new culture worshipped at the various shrines and holy places in Brighton albeit in their own unique ways. One such location is Saint Anne’s Wells. This is a known hotspot for paranormal activity, so if you are in search of Brighton ghosts then this is a great place to make a stop. The most prevalent tales involve demonic children with cat like eyes and it has been suggested that the site is a hellmouth which serves as a gateway between our world and the spirit world! The Hangleton Hangman is one of haunted Brighton’s most famous ghost stories! The Hangleton area was once home to a large set of gallows and many gibbets as well. Upon dying at the hangman’s noose, the offenders corpse would be placed in a gibbet and hoisted up on a pole where it was left to rot in full view of the town in order to serve as a warning. This attracted large numbers of crows, magpies and ravens who would feast on the rotten flesh. The area still plays home to unusually large numbers of these birds. However, this is not the strange part of the tale! The ghostly apparition of the hangman is frequently seen walking a large stretch of Hangleton Road. He is tall and broad and is usually dressed in dirty, tattered clothing including a executioner’s hood. More often than not he is said to be carrying a noose! Brighton’s Churchill Square Shopping Centre is said to be home to a bery unpleasant spirit who is known as either ‘Black Belly’ or ‘Angry Mick’. He is particularly aggressive and usually is glimpsed in the witnesses peripheral vision. He wears a shirt which is open at the bottom, exposing a bloated and bruised stomach. If the witness turns their complete attention on the apparition he will begin wailing loudly and charges at the individual! CCTV footage has recorded people reacting to him and fleeing, but Angry Mick himself is never seen on camera! Brighton was one of the British towns which really took a severe hit during World War II since it was actually used as a dump site for Luftwaffe pilots to jettison unused bombs before retreating. In 1940, the Odeon Theatre was bombed during a matinee performance killing a staggering number of local school children. This prompted Brighton to be declared part of the front line. The beaches were closed, the piers were dismantled and armed guards patrolled roads in and out of the city. On particularly affected area was the site where Brighton Library now stands. This is a fairly new development since up until the 1990s, the remains of the bombed buildings were still visible here. As you might expect the area has several ghosts linked to it including a little boy I pyjamas who clutches a wooden train and appears to be in some distress. The West Pier is another of the most haunted places in Brighton and it is haunted by a tragic spirit who tends to wander freely across a fairly large geographical area. The apparition of a gaunt, pale girl in tattered clothing is often seen on the seafront, on the pier and in some of the clubs that inhabit the seafront arches of Brighton. It is believed that she is the spirit of a young homeless girl who died of a drug overdose some time in the 1980s. Preston Manor actually lies in the village of Preston, which is now part of Brighton and Hove. The manor was actually built back in 1738 by a Lord Thomas Western. 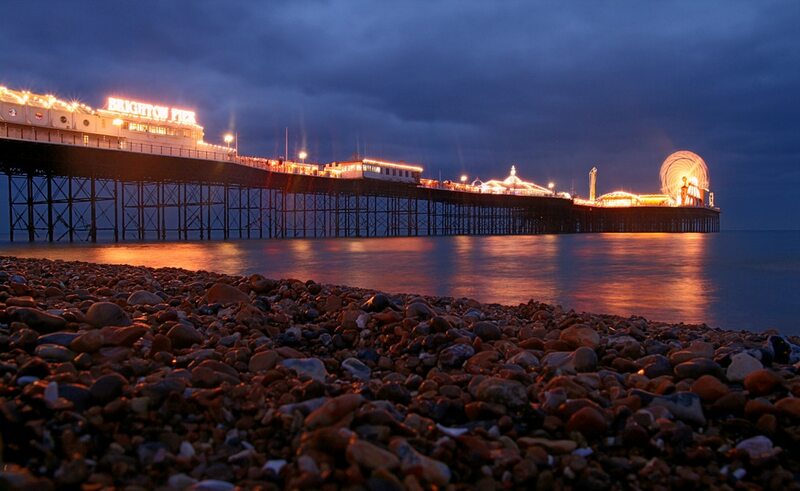 Over the last few years it has established its reputation not only as one of the most haunted places in Brighton, but in the United Kingdom as a whole. Every year the manor sees hundreds of paranormal investigators and ghost enthusiasts making their way to the property, attracted by the many ghost stories that are linked to the property. There are several Brighton ghosts that call Preston Manor home, but the most commonly reported is the White Lady. She has actually been spotted as far back as the 16th century! Her appearances seemed to peak in the 19th century. One particular report comes from a The Stanford Family who owned the property. One of Eleanor Stanford’s children saw the White Lady on the staircase. When the girl reached out to touch the woman only for her to disappear! Another one of the children also reports seeing the White Lady. It has been suggested that she may be the restless soul of a nun who was unjustly excommunicated from the church by the local friar. Following her death she was said to be buried in unconsecrated ground which would explain why she is still haunting the building. This theory actually fits in fairly well with reports that in 1897 the remains of a woman was uncovered at the rear of Preston Manor. The remains were reburied in St Peter’s Churchyard and apparently the sightings of the White Lady did become less frequent although she is still seen on occasion. However, the White Lady is not the only ghost that has been spotted in Preston Manor. The same children also reported seeing two ghostly men fighting on the stairs and claimed to have felt an evil and menacing presence in one of the bedrooms in the SouthWest of the house. This area of the house is also a hotbed of other activity including phantom heads appearing by one of the four poster beds, dresses being cut, objects being moved around and doors opening and closing on their own! Most recently, the reports of ghostly sightings have revolved around a different woman – The Grey Lady. She is seen in various different areas of the house including the staircase and the parapets. Security staff say they have seen the lady in old fashioned grey clothing.